This is a warm and quiet cottage very near the river with a fire place in the living room. Pleasant front and back garden with and open fire pit and a BBQ. 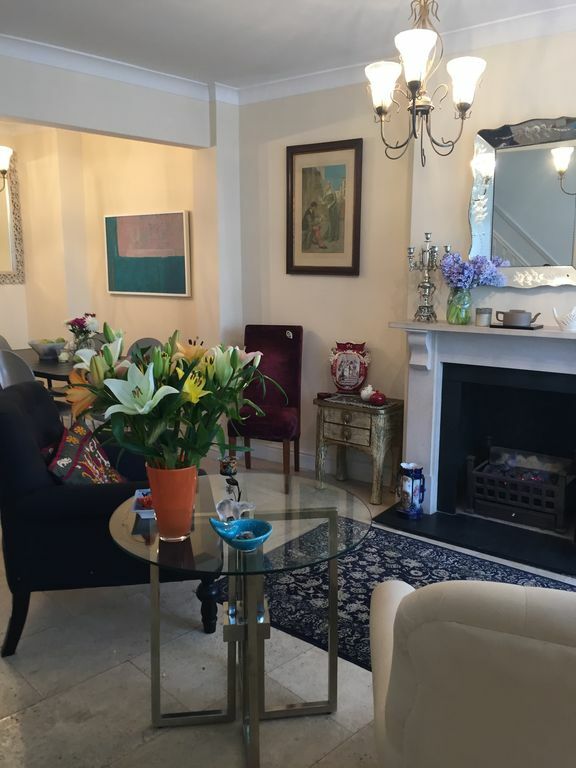 The house is located in Barnes which is near Thames.Great area well communicated to West-End. The property is within walking distance to river thames with lovely pubs and restaurants. transport by bus to hammersmith station and by train from Barnes or Barnes bridge station to Waterloo station. This flat could have been just the right spot as its location is convenient to shopping and transportation. However, we were not impressed with the décor nor the availability of some in-home expectations (no coffee maker, no use of second floor shower, only one full-sized bath towel in useable shower room). What’s more, we have to agree with Robert M.’s review from December 2018. The odor of competing fragrances (candles, potpourri, infusers) was overwhelming upon our arrival. Over time we noticed that these measures were meant to mask a smell of something sewer-like. We are afraid this was confirmed by owner when we questioned this and she suggested running the second floor shower. All searches on the internet describe this as a method to eliminate sewer odors emanating from a shower drain. We ended up sleeping in the third floor bedroom where the odor was least offensive. We would have stayed elsewhere if we could have found other accommodations. This flat has huge potential, but the owner needs to address some big issues to make it top of the line. I am so sorry you didn't enjoy your stay. They are always ample clean towels in the cupboard for guests to use. As for the smell it has been remedied since your stay. This house is my home and I live in it full time expect for the times that I travel for work, I have had many happy guests who enjoyed the property in the past. I do not include the 1st floor shower in the price as it is my private shower. Thank you for your feed back though. Upon entering property a overwhelming odor of disinfectant and not knowing what type of critter needed that strong application, we decided to vacate the premises immediately after calling owner. I did not tell owner about the smell , not wanting to engage at that time and , did not request a refund . We did seek lodging elsewhere.Home did seem clean. However, the photographer should get an award for the online display. Much better pictures than in reality. A nice comfortable property. Location was ideal for our trip and would hope to be able to use it again. Thanks. We really enjoyed our stay. It's quiet (a little aircraft noise but only to be expected) so it's a good place to unwind and chill out. Parking is limited as it is on street and fills up quickly. Best to park up and leave it there if you can. The stairs are a little steep and narrow but we managed ok. The local shops in East Sheen aren't too far away and Richmond Park is nearby. We spent a lot of time there enjoying the wildlife and the scenery. Ellie was a very accommodating host and we would be happy to stay here again.